LITTLE BIG FAN: Wearing Mitchell Kinney’s practice jersey as a cape, Jacob Franceschini listens in during a sideline huddle. 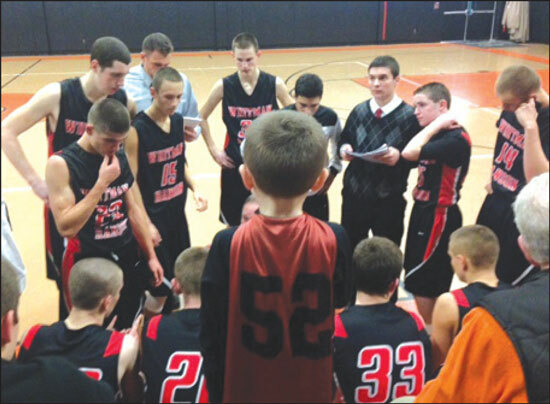 When 6-year-old Jacob Franceschini of Hanson met W-H basketball player Mitchell Kinney of Whitman during the winter basketball camp for elementary and middle school children it was, as they say in the movies, the start of a beautiful friendship. For Kinney, the youngest in his family — both he and Jacob have an older brother and sister in their families — he now has the experience of being a big brother figure for Jacob. At 6’7” make that a really big brother. It’s also a testament to the kind of mentoring Athletic Director Bob Rodgers has in mind for the program. Registration for the summer camp has just opened at whathletics.com. Programs are available for boys and girls with participation caps at 100 players. This was Jacob’s first basketball camp, said his mom Jessica Franceschini, adding he has played soccer and T-ball and is learning lacrosse this year. Basketball camp, however, has made a big impression on the shy little boy with a 1,000-watt smile. That smile is missing two front teeth from an off-target chest pass, but Jacob doesn’t seem to mind much. He’s already dreaming of wearing a Panther basketball uniform. In the meantime he wears the practice jersey Kinney gave him as a cape around the house, according to Jessica. At the end of camp, Rodgers had passed out game schedules for the varsity team and Jacob, who was sad that camp was ending, vowed to attend all the games. “Except for two,” Jacob said — the team’s Florida trip. Jessica set up her first Twitter account so her son could follow the team. He’s been invited to Jacob’s birthday party and they’re plotting a trip to do go-karts soon, if Mitchell can fit in one. The team even began developing a routine with Jacob, according to Jessica — coaches would say hello to him with their own handshake or fist bump and players would give him a high-five after warm-ups. Jacob has also become buddies with Kinney’s grandparents, who also attend games. Rodgers said anytime a parent can get their children involved in any activity it enriches them. Basketball is a sport that anyone can play on a leisure level and sometimes kids have the talent and drive to go further. Still learning the basics, Jacob’s mom said he is already showing an interest in defense. But when you get right down to it, he just wants to be like Mitchell for now. Kinney, who is deciding between sports science, sports medicine or criminal justice, said the experience of mentoring younger children is valuable. She said that sportsmanship contrasts greatly with some other teams the Panthers have played. The ratio of campers to high school player-coaches is around 6:1, which allows the coaches to get to know the younger kids. The summer camp is a bit more comprehensive than February’s, as every aspect of the game is covered in a full week with a lot of games played, Rodgers said. Fall clinics are geared more toward skill development and in February the campers become part of the high school program for a couple of days — taking part in practices and attending W-H games as a group.